Unity can never be experienced. If the experiencer and the experienced become one, then there is no experiencer to experience the oneness. So any explanation of oneness can only be a pointer that can never fully describe that state. You can begin your journey from a world of multiplicity to unity but you can never remember reaching your destination. Teasingly near. Tantalizingly close, and then… . Two years ago, a former colleague and a dear friend posted a painting on her Facebook page. I was immediately drawn to it, and asked her, almost like a child wanting a chocolate, that I too wanted this painting. She smiled indulgently and mentioned that it was by her artist cousin who lives in New Zealand and that she would try to get him to paint one more for me. Sure enough on my next birthday, I was greeted with a cardboard tube from New Zealand containing a similar painting. More on this painting later. I recently came across this photograph by Sebastio Salgado. 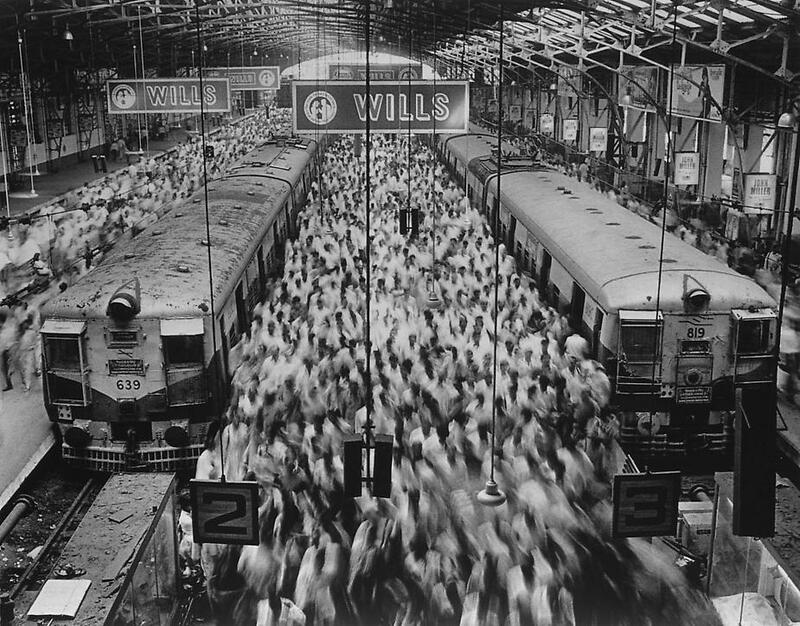 (http://blog.ted.com/2013/05/01/sebastiao-salgado-a-gallery-of-spectacular-photographs/) This was shot as a part of “Migration” series in 1995 at the Church gate station in Mumbai. I was so captivated with the photograph that I went back the next day to spend some more time absorbing its beauty. The print that the gallery had was large, whereas the images available on the Internet did not do justice in capturing the finer details. Amongst the sea of moving humanity, there are just two still images in the original photo. You can see one on the left side, an image of a lady sitting on the bench. The other one of a man standing against the flow is not visible in this image. As I was contemplating buying a print of this photograph and searching online for the same, I came across another photograph by Randy Olson framing the same image at the same location but a few years later. This photograph appeared in the National Geographic. As once can see, the difference between the two photographs was that the second one is in color and the movement of people was more pronounced. Coming back to the painting, the artist is NgAngA (www.ngangart.com) and this is what he had to say about the painting. “The scene is typical of any major city railway station anywhere in the world at Rush Hour, the peak of the daily commute. Surely most of you have experienced such a scene at least once in your life – a blur of motion and colour, as you dance through the crowd, either with or against the flow. When I first saw the painting, my reaction was one of seeing the moment in time when the world of multiplicity was converging into unity. In that sense the artists intention in creating the art work and my reaction to it were similar. I was highly enthralled by the simultaneous capture of plurality and oneness. My reaction to Sebastio’s work was similar. Although the movement to oneness is very subtle, the starkness of a black and white image and the mass of humanity converging into one was hauntingly teasing. Contrasting this with the image of two stationary people enhanced the movement even more. 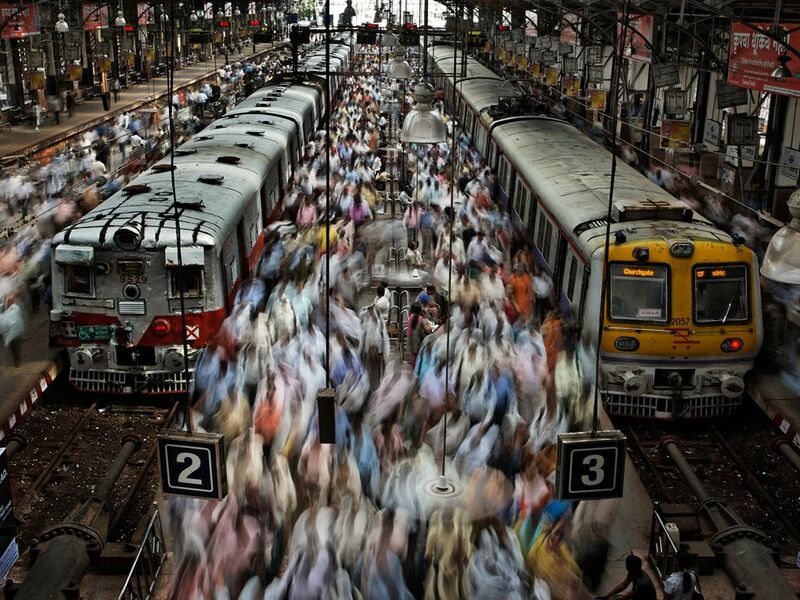 The aspect of the trains being static and the people in a movement is again beautifully captured. The details of the platform and the station subtly underlying the journey. NgAngA’s painting and words came rushing back the fore. I could see the connection between the two and immediately wanted to view both of them together. Discovering Randy Olson’s work was a stroke of luck. A troika waiting to happen. His work was a more direct expression of this movement. Whilst the contrast between stillness and movement is absent as everyone in the image is in motion, the movement of humanity is more pronounced. Sandwiched between Sebastio’s photograph and NgAngA’s painting, this image captures the transition perfectly. NgAngA’s work does not detail the station. It is just assumed. The perspective is at the eye level and you only can see the mass of humans that you are walking into or observing as they are walking towards you. The blur is very distinctly captured and so are the details of the occasional legs. The contrast between them sets you thinking of duality and oneness at the same time. If you go back and see the three images in one continuous flow, you can feel the movement starting slowly in Sebastio’s work, picking up momentum in Randy’s work and peaking in NgAngA’s painting. Assembling these three images together, I set forth on a journey from multiplicity into unity. Even though I could not experience unity, I was so teasingly near, sontantalizingly close…. I now see what you meant…I love the painting. Had you not described it as a painting, I would have mistaken it for a photograph. Capturing of the ceiling lights is just incredible! Great post Kiran… I would love to hear your thoughts on what is similar and what is not in the images. The individual people are of course different; but in some sense the collective seems the same. But there are subtle markers in the trains and the blank space where the “Wills” hoarding was dangling. I know your focus is on Vedanta but am curious as to your take on the temporal aspects of place.